This linky is designed to give everyone a place to show off their favourite posts and make sure they don’t go unread. We have a little change of hosts tomorrow with Julia from Rainbeaubelle taking a well deserved break after her husband recently being released from hospital. Instead we have the lovely Karen who blogs over at Stopping at Two who is stepping up to the plate and putting on her linky host hat for the first time ever. We are very pleased to have her and I know she is a little nervous so I know you will all give her a warm welcome. 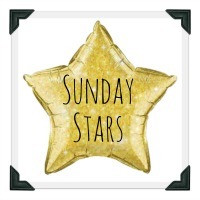 You can tweet your posts to either of us, myself at @mami2fiveblog and Karen at @karenjwhitlock and also the @SundaysStars account using the hashtag #sundaystars and we will RT. We’ll also be pinning your posts to the Sunday Stars pinterest board. After seeing all the fantastic posts that have been linking up we got together and all decided it would be a great idea to give a shoutout to last weeks host’s ‘star post’. They are both fantastic posts and I recommend you give them a read if you haven’t already! Next weeks hosts will be the lovely Stephanie from Diary of a Midlife Mummy & Lucy from Mrs H’s Favourite Things so keep an eye out for them next Sunday.